For Renee, the 2016 season opened at North Carolina’s Hickory Motor Speedway. The Saturday, March 26 event – The Easter Bunny 125 – was the inaugural Southern Modified Racing Series (SMRS) presented by PASS event. The Ed Bennett Properties backed team participated in an open test on Friday afternoon – taking advantage of some extended time to shake off the long winter months for both car and driver. On race day the team quickly found their groove – posting highly competitive lap times during official practice. Unfortunately an early draw for time relegated them to a disappointing 18th place starting position. Undaunted, at the drop of the green flag, Renee quickly worked her way forward – marching all the way up into the top-five. Eventually she settled into the sixth, then seventh, spot. The 125-lap event went green until an accident on lap 92 finally brought out a caution. When race control opened pit road, light rain had begun falling. The No. 59 team elected only to take a right rear – opting for track position – rather than taking the additional time needed to swap left-side tires, as planned. The team came off pit road in 11th. But, on the restart, quickly lost a few spots. With significant rain falling, the caution again flew on lap 108. The race was eventually red/checkered because of the continued rain. Next up the team is scheduled to run in the KOMA Unwind Modified Madness Series at Hudson, North Carolina’s Tri-County Speedway on Friday, April 1. *Editor’s Note: The Tri-County race has been postponed to July 29 because of inclement weather. An update is long overdue… So, to that end, in no particular order here are some things Renee has been up to. In early June another racing opportunity was born when Renee and veteran team owner Ed Bennett collaborated with several others to bring a Modified to Wall Stadium Speedway (Wall Township, NJ). The group effort came to fruition with an engine by Rob Ormsbee and Tom Martino (MB Race Engines); a chassis from Renee’s long-time team owner Bill Woodman and weekly maintenance by Ed. The team’s first outing came on June 28 at the Garden State Classic – a 125-lap extra distance event. After twice getting flat-out wrecked in the Garden State Classic, the team returned on July 19 for a regular 40-lap event. Starting from the 12th spot, Renee ran most of the race inside the top-ten. After battling through multiple restarts she came home in the 7th spot. With no set schedule, the team will likely head back to Wall for the August 30 ‘Beach Luau’ show. Renee has kept an extremely busy schedule between her 9-5 job with the International Brotherhood of Boilermakers Northeast Area Apprenticeship Program, weight training, dressage lessons and her blossoming web design business. Renee has continued to work various ‘Ride and Drive Programs.’ Most recently she represented Cadillac at the prestigious Greenwich Concours d ‘ Elegance. Aside from her work with consumer events, Renee has additional performance driving programs lined up for the fall. 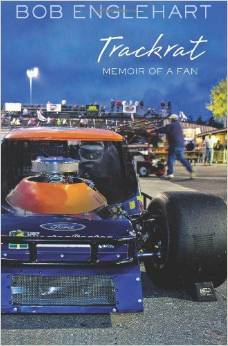 On April 1, ‘Trackrat: Memoir Of A Fan’ was published by Bob Englehart. Bob, perhaps best known as The Hartford Courant’s Editorial Cartoonist, was compelled to explore the world of short track racing after witnessing a tragic accident that claimed the life of Boston-area driver Shane Hammond (Thompson International Speedway – April 6, 2008). Renee was interviewed extensively for the memoir; the results of which can be found in the ‘Carbon-X Fire Retardant Sports Bra’ chapter, as well as throughout the book. To promote the book, Renee is scheduled to appear at a book signing/panel discussion on September 16 at 7 PM at the Mark Twain House (Hartford, CT). The paperback book is available for purchase on Amazon. On June 24, Renee joined several area teams and drivers at the Connecticut Children’s Medical Center in Hartford, CT. Racecars were on display and drivers brought along giveaway items for the young medical center patients. In June Renee was a guest of longtime friend (and 1992 Indy 500 Rookie of the Year) Lyn St. James at the SVRA’s inaugural Brickyard Vintage Racing Invitational at the legendary Indianapolis Motor Speedway. Lyn participated in two events – including the Indy Legends PRO-AM. The Pro-Am was contested on the 2.43-mile Gran Prix Circuit and was open to drivers competing in previous Indy 500s. Renee spent the weekend cheering Lyn on and catching up with a group of close friends. Back several years ago, Renee first discovered Hand Kind SCRUB – an industrial strength hand cleaner from KINDERMA. From their initial introduction, Renee and her family were hooked – declaring it the best hand cleaner they had ever used. Fast forward to the summer of 2014, when Renee rekindled her working partnership with KINDERMA inventor Scott Kennedy. At the track, be sure to stop by Renee’s car – or visit her during autograph sessions – where she’ll be handing out KINDERMA samples. gearhead girls racing recently invited Renee to a unique and exciting event which has been established to connect America’s racing ladies with the Speed Sisters. 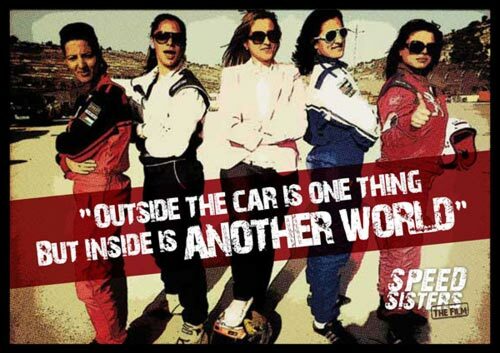 The Speed Sisters are the first all-woman motor racing team in the Middle East. On March 3, 2014 this once-in-a-lifetime track day and reception will be hosted at Connecticut’s Lime Rock Park and The Falls Village Inn. Proceeds from the event will help fund Speed Sisters The Film – a forthcoming documentary supported by the Sundance Institute and BritDoc Foundation. For more detailed information, please take a moment to read the Press Release. During the event, gearhead girls racing will host Marah Zahalka, the youngest of five Speed Sisters. Marah is slated to speak at TEDxTeen in New York about her journey as a driver in Jenin, part of the Occupied Palestinian Territories. Against a backdrop of political upheaval unimaginable by many here in the US, Marah bonded with the Speed Sisters over a common desire to live life on their own terms. She’s now coming here to drive on American soil and share her story. 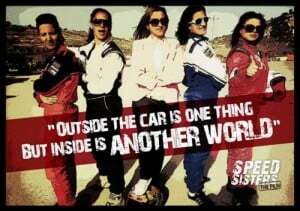 The Speed Sisters documentary is both intimate and action-filled; and captures the drive to follow your dreams against all odds – leaving in its trail shattered stereotypes about gender and the Arab world. The ﬁlm has already built an enthusiastic global audience and articles about the Speed Sisters have appeared in dozens of top publications. Join the tens of thousands of people that have already viewed and shared the trailer for this work in progress. Stephanie Economu, founder of gearhead girls racing, has long worked to fill a need for women racers by founding an online community for networking with other drivers. Renee had the pleasure of meeting Stephanie several years ago when she was working with the prestigious Lime Rock Drivers Club. The two became fast friends and have kept in touch since. The track day and reception on March 3 creates an opportunity for women from both sides of the world to celebrate what can be accomplished when a team pushes ahead at full speed. Both Stephanie and Renee invite you to join the history making event! To RSVP or to make a donation, please visit the gearhead girls racing website.